I asked Lord Bingham – Did you put it in writing? A QUESTION I put to Britain’s most senior Law Lord, Lord Bingham, on Monday evening seemed to throw him. I knew he – as well as fellow Law Lords – had refused to meet government ministers in 2005 over a judges’ ruling on a terror case, and I wanted to know whether Lord Bingham had replied in writing. I had gone up to him after he left the platform in the main hall of Westminster School, where a panel of leading academics, Shami Chakrabarti, director of Liberty and himself had discussed the subject of Law and Politics. At the time, an angry Home Secretary, Charles Clarke, had made headlines in the press. But it had only been his version of events. Apparently, the judges remained silent. I was about to tell Lord Bingham that I was a member of the press when a friend of his – probably a fellow judge – saw him and drew him away. A few minutes before, Lord Bingham had made what seemed to be the first public disclosure of the row. 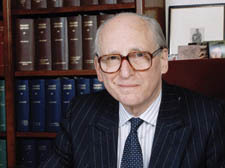 After a 90-minute discussion on the subject The Law and Politics – led by a panel including the eminent academics Vernon Bogdanor and Peter Hennessy – Lord Bingham began to speak about the events of 2005. He looked as if he was making a historic disclosure. It is rare for a senior judge to go public on discussions with government ministers. Lord Bingham said that in December 2004 he had been a approached – after the “Belmarsh” judgement on a terror case – to meet the Lord Chancellor, Lord Falconer, Attorney General Peter Goldsmith and Charles Clarke. When he asked what kind of a meeting it would be, he was told it would be a “social occasion”. After discussing it with fellow Lords, Lord Bingham said it was clear they did not think it would be a “social occasion” and would therefore decline the invitation. A low ripple of laughter ran throughout the packed hall at the thought, perhaps, that the government had been caught out for leaning on the judiciary – a heated topic of the evening. The separation between the judiciary and the executive – the government – lies at the heart of our democracy. There was a note of mockery in her voice. In the discussion, Ms Chakrabarti had described how the Human Rights Act was under attack, mainly from the press, and contrasted Britain with the United States, where though the constitution may be “battered and bruised” it sill remains a bulwark for human rights. Professor Bogdanor said he was more interested in the movement for political change coming from below in society, not just from the top. Joking about the judiciary, Mr Hennessey recalled how in the Profumo scandal in the 1960s, a member of the cabinet told the prime minister Harold MacMillan he had heard that eight High Court judges had been involved in orgies. HAPPY fifth birthday to the London Review Bookshop (LRB) in Bloomsbury. How pleasant it is to see an independent store buck recent trends in the trade and be positively blooming. I headed down to their Bury Place HQ for a glass of celebratory champagne last week and joined a host of writers who frequent the shop and the pages of the LRB magazine: I spotted Jonathan Coe, Tibor Fischer, Adam Thirwell, Geoff Dyer, Martin Rowson and Nikita Lalwani, quaffing wine and nibbling nibbles among the tomes. I also spotted Kentish Town-based Law Lord Sir Stephen Sedley gossiping with historian Eric Hobsbawm, who lives in South End Green, while other faces among the canapés included Iqbal Ahmed, who wrote the London travel book Sorrows of the Moon, and works as a night porter at the Holiday Inn hotel in Swiss Cottage. But it was left to Tariq Ali to lead the birthday tributes. Tariq was in an expansive mood, and even managed to find time to praise his old bête noire, the United States of America. He added that the secret to the bookshop was the passion of the staff. “The establishment of this bookshop was so against the grain, like the magazine that set it up. In a culture that is completely conformist, you risk being accused of insanity when doing something like this. “But at the LRB, its not about silly fads – books here have a long shelf life. They have managers who actually read books, people who love books, and that is extremely important. IT’S a pity our foreign minister David Milliband wasn’t at his old school – Haverstock School – on Friday evening where a packed audience of family members and pupils soaked up a scintillating show of songs, dance and soloists on the piano. If Milliband had been in the hall he would have heard a rollicking rap sung by a young Asian girl who berated the government for its “lies” about the Iraq war. I bet Milliband, who attended the school in the 1970s, and is a supporter of the war, would have squirmed in his seat. But the audience gave the girl and her band a deserved thunderous applause. After the hour-and-a-half show, Jim Mulligan, chairman of the governors, made a short speech praising the approach of Haverstock head John Dowd to education – allowing children to develop their self-confidence through music and school club activities, such as chess, as an essential step to learning. It couldn’t have been put better. But I wonder what the children’s minister Ed Balls would make of it? He’s imposed a target on all schools that at least one-third of pupils should gain five GCSEs. Does music, and the concept of self-confidence, come within his field of vision?